Using the web platform to deliver rich web apps for mobile users has been in the market for years. However, wrong approaches, slow engines and bad implementations buried the approach for a couple of years. Today, new engines and devices are available, as well as new frameworks and best practices that make the Web app development approach useful and valid again, not just on mobile devices but also on smart watches and other devices. 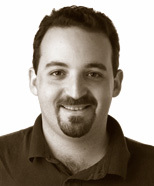 Max Firtman is a mobile+web developer, trainer, speaker and writer. He is Adobe Community Champion and founder of ITMaster Professional Training. He wrote many books, including "Programming the Mobile Web" and "jQuery Mobile: Up and Running" published by O'Reilly Media. He is a frequent speaker at conferences, including QCon, OSCON, Breaking Development, Velocity Conference, Fluent, Google Developer Day, Nokia Developer Days, Campus Party Europe and many other events around the world. He has received different recognitions, including Nokia Developer Champion yearly since 2006; Adobe Community Champion in 2011, and a Google recognition for being one of the most innovative mobile developers.